KILLINGTON—According to U.S. Ski Team estimates, 30,000 fans came out to cheer on the fastest female alpine skiers in the world Saturday and Sunday at Killington Resort. Saturday’s Audi FIS Ski World Cup Giant Slalom event turned out well over 16,000 fans according to multiple sources, with Sunday’s Slalom event almost as well attended. It was the first World Cup held on the East Coast in 25 years; the first in Vermont in 38 years. It was a record-setting crowd for a ladies’ World Cup event of this kind, former Olympian and fellow Vermonter Doug Lewis announced to the crowd Saturday. Mikaela Shiffrin, age 21 from Eagle-Vail, Colo., grabbed fifth place in the Giant Slalom event Saturday, disappointing herself as she had hoped to claim a podium spot in both the GS and Slalom events. Tessa Worley of France took the top podium spot in the Giant Slalom, followed by first-run leader Nina Loeseth of Norway, 0.80 seconds back, and Sofia Goggia of Italy in third, 1.11 seconds off the leader. Marta Bassino finished fourth ahead of Shiffrin who was 1.24 seconds slower than the winning combined time. Shiffrin, however, was favored to win the Slalom race Sunday, having won the last nine consecutive Slalom races that she competed in. She was the first to race Sunday, wearing bib No. 1, tearing down the course at 9:30 a.m. and setting a time that none of the other racers could touch—she led the pack by 0.65 seconds going into the second run. Going first certainly has its advantages, so the order is reversed for the second run with only the top 30 making the cut. Holding the lead spot, Shiffrin raced last for what would be a storybook ending to cap off the weekend for the home crowd. While she had a couple of small bobbles in her second run, Shiffrin was able to extend her first-run lead, finishing 0.73 seconds ahead of Veronika Velez Zuzulova of Slovakia who took second place, and 0.86 seconds ahead of Wendy Holdener of Switzerland who finished third. The Killington victory was Shiffrin’s 21st World Cup win. Race day festivities began Saturday with a 1,000-kid parade with dozens of ski clubs and academies marching with banners into the spectating arena. Kids of all ages hooped and hollered as they waved flags, giddy with excitement for the races. 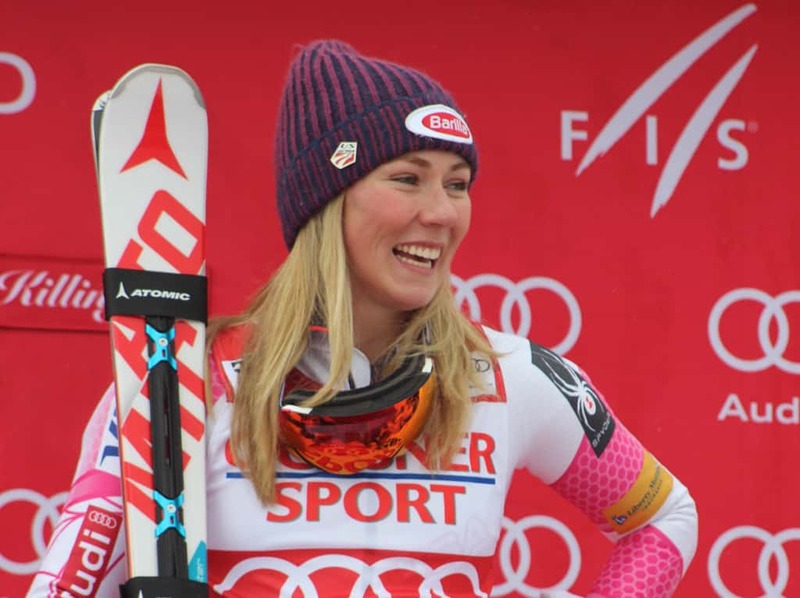 Many young racers, as well as fans, held signs supporting specific racers—Shiffrin being a clear crowd favorite having grown up just across the border in New Hampshire and having trained at Vermont’s Burke Academy before moving to Colorado. Shiffrin spent hours signing autographs for aspiring athletes over the weekend. Shiffrin, who has raced on the World Cup circuit since she was 15 years old, was asked multiple times throughout the weekend how her leadership role has changed now that she is no longer the youngest on the team, and given her podium successes. While she skis for herself, Shiffrin did add that she was excited to be able to ski in front of so many fans and family members. “My entire family lives on the East Coast. We had a big group of people here and I got to see them for Thanksgiving, which was incredible … The fact that my Nana was able to watch this race is amazing. I can’t put that into words. The proudest I’ve ever been is winning a race in front of my Nana. The best part about it is that she doesn’t care whether I win or lose. She might not even remember! She doesn’t care—she loves me. Thanks, Nana, for your unconditional love and your incredible pies,” she said, enticing laughter from the audience at the press conference Sunday. Giant Slalom: Nina O’Brien, from Edwards, Colo., and Patricia Mangan from Derby, N.Y., started their first World Cup in Killington, and Alice Merryweather from Hingham, Mass. skied her first World Cup Giant Slalom. Unfortunately, O’Brien didn’t qualify for a second run and Mangan and Merryweather did not finish their first runs. Slalom: Resi Stiegler, from Jackson, Wyo., finished 17th. Lila Lapanja, from Incline Village, NV, and Megan McJames from Park City, Utah, did not qualify for a second run. Nina O’Brien from Edwards, Colo., and Patricia Mangan from Derby, N.Y., who were racing their first Slalom World Cup, did not finish their first run. MORE PHOTOS AND STORIES COMING SOON IN THIS WEEK’S EDITION.